Select team size at checkout. Is this a secure checkout? Yes. We use industry standard secure technologies to ensure your order information is sent to us securely. When paying with credit card your card details are stored in a PCI compliant system as required by the card issuers. We also use an extended validation secure certificate so you have peace of mind you're dealing with an independently verified real business. Look for the green address bar or green padlock and our company name “Cinergix Pty Ltd”. Yes. Simply drop us an email and we will change your plan. We like to hear why you want to change but you don’t have to tell if you don’t want to. Yes you can. We don't have long term contracts. Even if you downgrade to the Public/Free plan, you can still access your private diagram data. However, if you cancel your plan midway through a billing cycle, we will not provide a refund for the remainder of the billing cycle. Simply drop us a mail. We have a number of help and tutorial options available. If you need an overview of Creately take a look at this Youtube video. If you need some help with a specific task take a look at our help pages. And for the full list of support options check out this article. Yes, all your personal data is encrypted during transmission to our servers and is stored in our secure servers which are constantly backed-up. And we won't share your email or details with anyone. Can I keep a copy of my diagrams offline? All Personal and Team plans come with the ability to export and backup your diagrams locally in the Creately Document Markup Language format (*.cdml file). This is a standard XML file that has all the data needed to recreate your diagram. Are you a charity, open-source project or all-round do-good'er? Contact us at sales@creately.com for a Creately Scholarship and receive access to Creately at deeply discounted rates. Looking for a solution for your school or campus? Contact us at edu@creately.com for special educational rates. Yes. We use industry standard secure technologies to ensure your order information is sent to us securely. When paying with credit card your card details are stored in a PCI compliant system as required by the card issuers. We also use an extended validation secure certificate so you have peace of mind you’re dealing with an independently verified real business. Look for the green address bar or green padlock and our company name “Cinergix Pty Ltd”. Where are my diagrams stored? Your diagrams are stored on your local computer; the computer you install Creately Desktop on. We store the diagrams in a folder within your user profile. 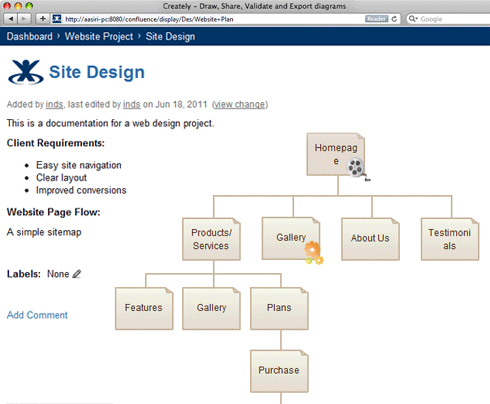 You can manage the diagrams through Creately Desktop. Diagrams Anywhere enables your diagrams to be synchronised with our servers so you can access them through your Creately Online account from any computer. You can turn off the synchronisation if you want to. Glad you asked. After the first year of Creately Desktop ownership your license will continue to work and you’ll still be able to create, edit and manage your diagrams on your computer. However your Creately Online access will stop and so will your Creately Desktop updates and the syncing of your diagrams to our servers. You’ll be able to re-enable the updates, syncing and support by purchasing a new Creately Online premium plan. You can get more details of what happens in this forum article. You can install it directly from our website. Just visit the Creately Desktop product page and click the ‘Install Now’ button and your installation will begin. If you have issues try downloading Adobe Air first and then try again after a computer restart. Here's what others are saying about Creately. 90% of our customers love using Creately and would recommend it to a friend. *Pricing is for the Creately for Confluence Flexible License. Price per activated Creately user. The number of activated Creately users can be a subset of the total Confluence user list. Activated users can Create and Edit diagrams, all users can view the images embedded in the Wiki pages. What is a Flexible License? A Creately Flexible License is a license that you buy directly from us. It allows you to license just the editors of your diagrams while at the same time allowing all your other Confluence users to view the diagrams. When you install a Creately Flexible License a new Confluence group is created to which you can add your chosen editors. The editors can be changed at any time and as many times as you like without contacting us. Each Creately Flexible License comes with one year of updates and support. Further years of maintenance can be purchased at any point and are 50% of the new license price. If you have any questions please email us. What is Creately for Confluence? Creately for Confluence is an online diagramming plugin that enables you to create and edit diagrams from within your Confluence server. Where is Creately for Confluence installed? Creately for Confluence is directly installed onto your Confluence server, which allows you to add flowcharts, UML diagrams, mockups and more to your Confluence wiki pages and blogs. Your diagrams are stored in your local Confluence server. They are stored as versioned attachments to wiki pages or blogs. How do I install and use Creately for Confluence? Installing Creately for Confluence is simple. In modern Confluence instances you should be able to search for “Creately” in the Atlassian Marketplace through the UPM and install it directly. If you need more details the installation guide will provide you with the steps to getting Creately for Confluence installed. The usage guide provides details of how add diagrams and perform other tasks with the plugin. The main difference is how diagram editors are licensed. An Atlassian Marketplace Creately license requires that the Creately for Confluence plugin license matches the size of your Confluence license. So if you have a 500 user Confluence license then the Creately plugin license must also be 500 users. The Atlassian Marketplace license is also purchased directly from Atlassian. A Creately Flexible License enables you to purchase a license to cover just the editors of your diagrams with everyone else being able to view the diagrams in your wiki pages. So if you have a 500 user Confluence license then the Creately plugin flexible license could be 10, 25, 50 or any size you choose to cover just the people who will be creating and editing the diagrams. Why do I have to register on Creately to get a Flexible License? Our online system requires a one time activation from the Confluence installation to activate the purchased flexible license. Beyond that there is no communication needed during normal Creately plugin usage inside your Confluence server. If your Confluence server doesn’t have Internet access you’ll need to contact us for an alternative activation method. Where can I read the Creately for Confluence End User License Agreement (EULA)? The EULA is available here. Please make sure to read the Term and Conditions of this License Agreement carefully before continuing with installation of the Creately plugin. *Pricing is for the Creately for Confluence Flexible License. Price per activated Creately user. The number of activated Creately users can be a subset of the total JIRA user list. Activated users can Create and Edit diagrams, all users can view the images embedded on their JIRA issues. A Creately Flexible License is a license that you buy directly from us. It allows you to license just the editors of your diagrams while at the same time allowing all your other JIRA users to view the diagrams. When you install a Creately Flexible License a new JIRA group is created to which you can add your chosen editors. The editors can be changed at any time and as many times as you like without contacting us. Each Creately Flexible License comes with one year of updates and support. Further years of maintenance can be purchased at any point and are 50% of the new license price. If you have any questions please email us. Yes. We use industry standard secure technologies to ensure your order information is sent to us securely. When paying with credit card your card details are stored in a PCI compliant system as required by the card issuers. We also use an extended validation secure certificate so you have peace of mind you’re dealing with a verified business. Look for the green address bar or green padlock and our company name “Cinergix Pty Ltd”. What is Creately for JIRA? 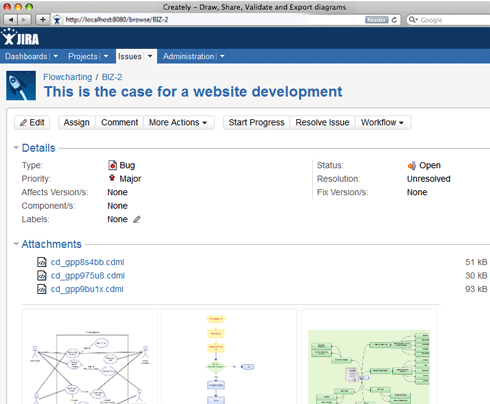 Creately for JIRA is an online diagramming plugin that enables you to create and edit diagrams from within your JIRA server. Where is Creately for JIRA installed? Creately for JIRA is directly installed onto your JIRA server, which allows you to add flowcharts, UML diagrams, mockups and more to your JIRA issues. Your diagrams are stored in your local JIRA server. They are stored as versioned attachments to the JIRA issues. How do I install and use Creately for JIRA? Installing Creately for JIRA is simple. In modern JIRA instances you should be able to search for “Creately” in the Atlassian Marketplace through the UPM and install it directly. If you need more details the installation guide will provide you with the steps to getting Creately for JIRA installed. The main difference is how diagram editors are licensed. An Atlassian Marketplace Creately license requires that the Creately for JIRA plugin license matches the size of your JIRA license. So if you have a 500 user JIRA license then the Creately plugin license must also be 500 users. The Atlassian Marketplace license is also purchased directly from Atlassian. A Creately Flexible License enables you to purchase a license to cover just the editors of your diagrams with everyone else being able to view the diagrams in your wiki pages. So if you have a 500 user JIRA license then the Creately plugin flexible license could be 10, 25, 50 or any size you choose to cover just the people who will be creating and editing the diagrams. Our online system requires a one time activation from the JIRA installation to activate the purchased flexible license. Beyond that there is no communication needed during normal Creately plugin usage inside your JIRA server. If your JIRA server doesn’t have Internet access you’ll need to contact us for an alternative activation method. Where can I read the Creately for JIRA End User License Agreement (EULA)?